History and Scripture show that ever since Adam and Eve men tend to want a God cut down to their own size: a God fashioned in their own likeness. What they don’t want is a God of infinite perfection who asks them to rise above themselves, above concupiscence and self-love, and strive to be perfect, even as their heavenly Father is perfect. Men who have a strong tendency to be this way are likely to have difficulty also with the mystery of the Incarnation. Their hearts find it intolerable that an Infinite God should so love the world as to give His only-begotten Son to die in torments for love of us. You understand that what makes this intolerable is the implied obligation of making a like return of love; of putting off the “old Adam” and conforming oneself to Christ the new Adam. During the first several centuries of the Christian era, all the possible errors against the mystery of the Incarnation were thought up, flourished for a time, and received formal condemnation from the universal Church. Today the modernists come along with a sort of package-deal of these old errors and sell them to the unwary (especially our young people) as “new insights”, and “ongoing revelation”. Revelation from the devil! The revival of these heresies, now spread everywhere by priest and teachers under the tolerant eyes of spineless bishops, makes it virtually impossible for their victims, ignorant of the Scriptures as they are (or poisoned by false versions) to grasp the ineffable depth and beauty of the Incarnation, the Redemption, the holy Sacrifice of the Mass. Their teachers deprive them on the one hand of sound education in the fundamental truths of who God is, who we are, and who Jesus Christ is, while on the other hand the victims (especially the young) succumb all too easily to the seduction of blasphemous (not to mention immoral) songs and entertainments, gravely offensive to God and His most holy Mother. Worse, these same songs and entertainments are sometimes performed in the church, notably around Good Friday, the day Christ died for us. Given such circumstances, true shepherds of souls must repeat and explain the divine mysteries over and over, and from every angle. When the Church teaches that Jesus Christ is the Son of God, she means that in Him there is only one Person, the Person of God’s only-begotten Son, “born of the Father before all ages: God of God, light of light, true God of true God; begotten, not made, consubstantial with the Father: by whom all things were made. Who for us men and for our salvation came down from Heaven…” It is this Person, this eternal Son of the eternal Father who, at the time foretold by the prophets, assumed a true human nature, conceived miraculously in the bosom of the Immaculate Virgin Mary by the over-shadowing of the Holy Spirit. Note that what He took was human nature. No new person was created – only a perfect, real, ideal human nature: a flawless body (in which flowed the blood of Adam, Abraham and David, from whom His Mother was descended), and a human soul with its proper created faculties of intellect and free will. It is impossible to stress too much the fact that the Holy Spirit did not create for Jesus a human personality.Instead the eternal Son of God so joined a perfect human nature to Himself (in what is called the Hypostatic Union) that He, the Eternal, is the “I”, the only I, to whom it belongs. The function of nature is simply to live, the function of personality is to own. In Jesus, then, there is one Person, but with two natures, the divine and the human, the eternal and the created. “Nothing short of this substitution of divine Personality for created personality will do justice to the traditional view of Christ, the Son of God. I make so bold as to say that Hypostatic Union, thus stated with theological exactness, is indeed worthy of the admiration of the keenest intellect. The whole difficulty resolves itself into this question: Is it possible for Infinite Personality to perform the function of finite personality in an individual created nature? It is in this, and in no other sense, that God is said to become man…” (The Personality of Christ (1914), Ch. VI). “Actions belong to the person”, as the philosophers say, so it follows that every word or act of Our Divine Lord on earth was theandric, i.e., the word or act of a divine Person. It was to be attributed to God, and therefore was of infinite dignity and merit: a single tear or sigh of the Savior would have sufficed to redeem the human race. Further, since every word or work of Jesus was divine and inspired by infinite Wisdom, it was a sermon for us. He is the perfect Model for all men of all time. To imitate Him, to live by His counsels, is divine wisdom. “I (in My own Person) am the Way, the Truth and the Life. No one comes to the Father but through me. If you had known me, you would also have known my Father.” The eternal Word does not need human words in order to teach and to preach. His whole life on earth, from beginning to end, was a continual revelation of God. “Our Lord willed to experience all the sufferings of body and soul which were fitting to His mission as Redeemer and Victim. He chose to go through all our trials, to go to the utmost limits of sacrifice in order to expiate our sins and merit eternal life for us by leaving us the example of the loftiest virtues amid the greatest adversity. 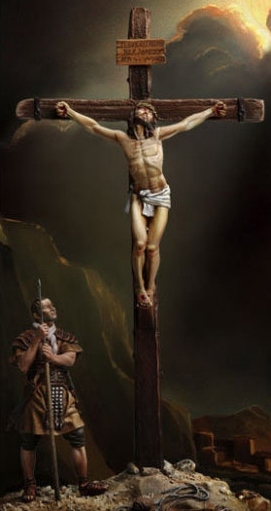 He was a victim in His Body: His garments were torn off Him, He was mocked, struck, scourged, until His Body was one vast wound; He was crowned with thorns and spat upon…He was nailed to a cross between two thieves. 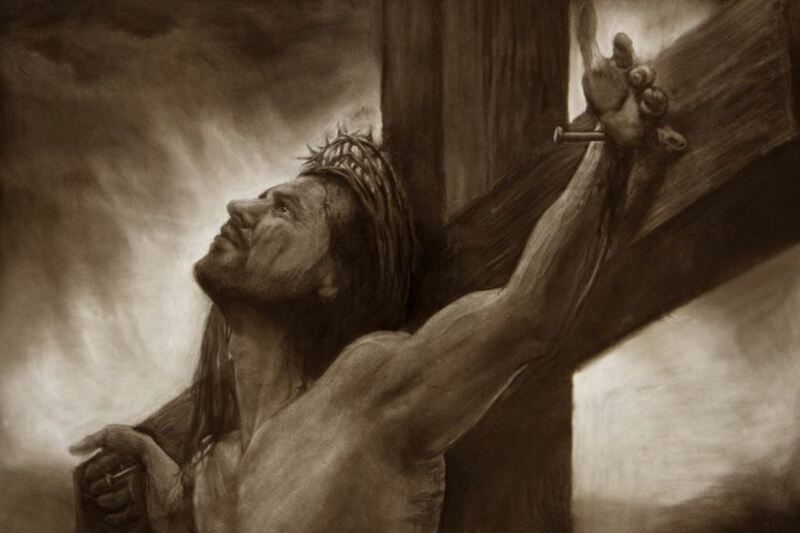 He was given gall to drink, and He was sneered at as He hung, dying.